Smart buildings deliver services that make occupants productive at the lowest cost and environmental impact over the building lifecycle. To do this requires adding intelligence from the design phase through to the end of the building’s useful life. Smart buildings use information technology during operation to connect subsystems, which typically operate independently, so that these systems can share information to optimize total building performance. Smart buildings look beyond the building equipment within their four walls. They are connected and responsive and they interact with building operators and occupants to give them new levels of visibility and actionable information. The Internet of Things (IoT) is advancing a new breed of smart buildings that are better aligned with the priorities of property owners and managers. IoT enables operational systems that deliver more accurate and useful information for improving operations and providing the best experiences for tenants. 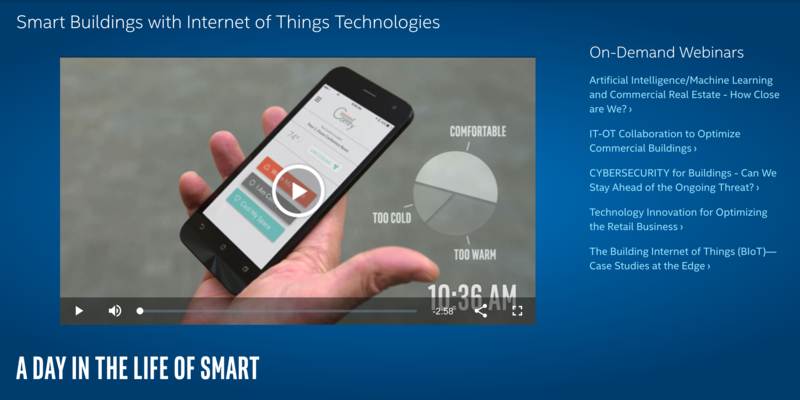 Accelerating this transformation, Intel offers IoT building blocks that simplify how building systems talk to the cloud and exhaustively analyse building data to uncover new business insights capable of driving real value and greater performance get more from building data, and ultimately, make better decisions. Conference solutions vary greatly from business to business. 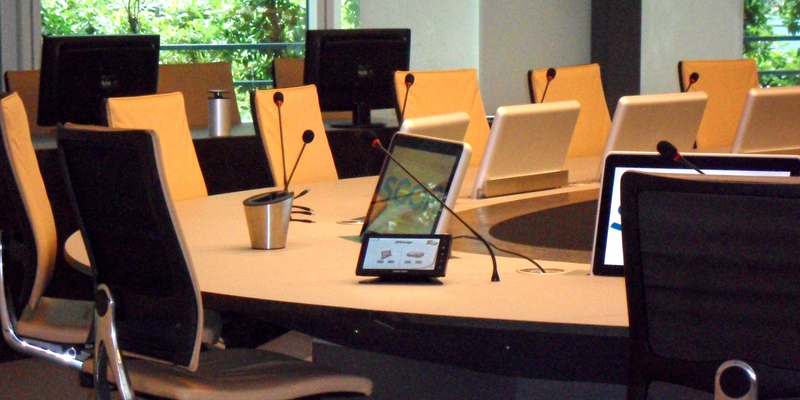 Although the basic objective of all conference facilities is similar, the factors that need to be considered for conference audio visual installations are diverse – including space, building or room layout, the need for remote participation and ensuring that the technology is future proof and will not become dated quickly. Our conference room solutions are tailor made for each customer, taking into account all of your needs, including your budget, to ensure that we can provide you with the most cost effective installation to achieve your goals. 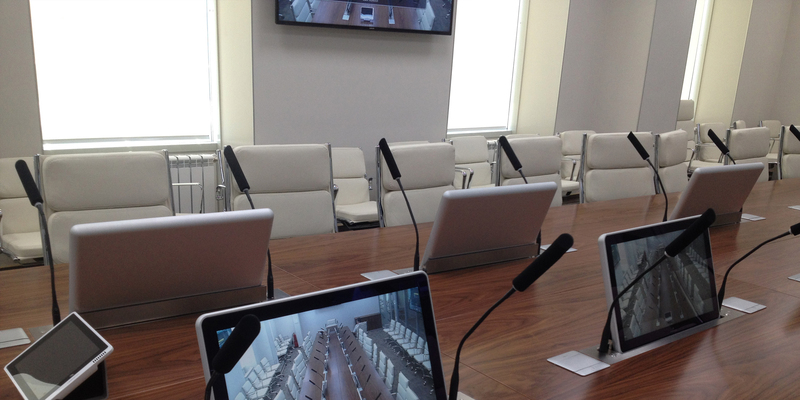 We have designed and deployed many conference room AV systems across a variety of sectors. 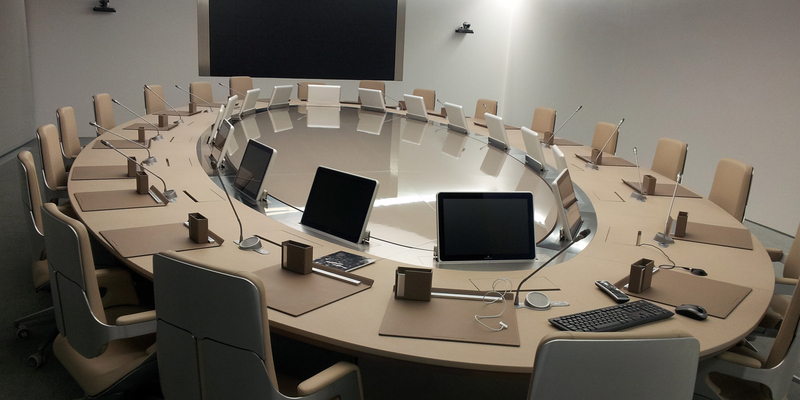 The technology that we use to implement conference room solutions is highly advanced and delivers exceptional results. Each project that we undertake starts with a needs assessment. We listen to you so that we can thoroughly understand your requirements, expectations and any constraints before we begin designing. Our conference AV equipment is user-friendly, can integrate with your existing IT resources, include the latest technology, are future proof and include training and support. “A large room typically used for instruction, lecture theatres differ from that of the traditional classroom or other learning spaces. The lecture theatre design is based on that of the auditorium, designed for an audience and performer relationship, providing spectators with excellent visibility of the main stage or platform. Most lecture theatres are installed with tiered seating, enabling those sitting right at the back to be able to see what is happening at the front. The design of a lecture theatre has a significant influence on the learning experience, it should be optimised for creating an environment which stimulates concentration and interaction. A badly designed lecture theatre does the opposite of encouraging learning, causing even the most attentive of students to lose focus during the lecture. Obviously, the quality of the audio-visual material itself is important, but this is of no benefit unless the theatre stimulates absorption. Lecture theatre design must incorporate a number of features in order to provide optimum studying conditions. 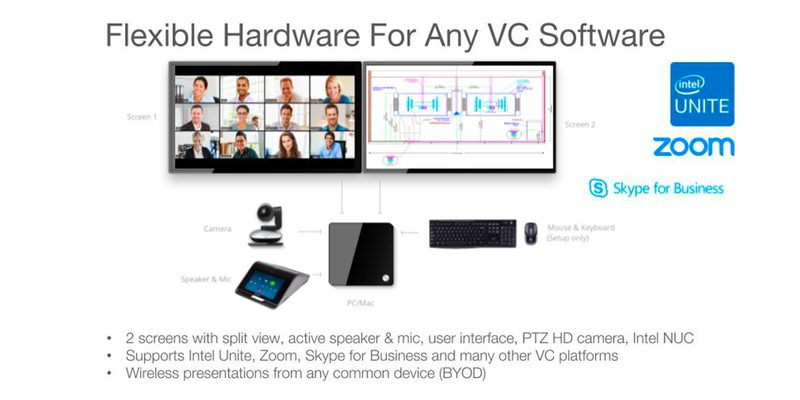 For partners such as Intel, ZOOM and SKYPE we have designed a series of standardised meeting rooms that can be easily deployed across an organisations meeting suites throughout the world. This optimised standards based approach allows a uniformity of meeting space for users regardless of which office they may be located in allowing organisations the ability to roll out thousands of rooms efficiently globally saving time and money and most importantly easy to use and support. Huddle rooms enable you to do more with less: Unlike the corporate atmosphere of an executive conference room, huddle rooms provide a more flexible approach to getting work done in a less formal environment, which makes them magnets for millennials seeking a collaboration oasis. However, don’t be fooled by a huddle room’s small size and laid back style. These little dynamos are great for taking care of serious business like webinars, sales presentations, job interviews, and more. Their nimble size also makes them a budget-friendly option since equipping four huddle rooms typically costs less than outfitting one conference room, and yet they offer four times the productivity potential. 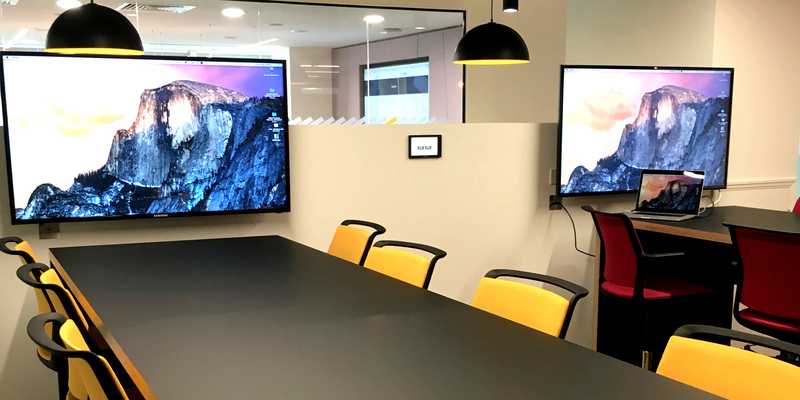 Our professional Boardroom AV enables you to work collaboratively with clients, customers and colleagues regardless of where they are in the world. Our integrated room AV includes audio and video conferencing solutions that combine crisp, clear image and sound with reliable management and hosting systems. To assist with scheduling meetings, we provide functional and easy-to-use room booking systems. 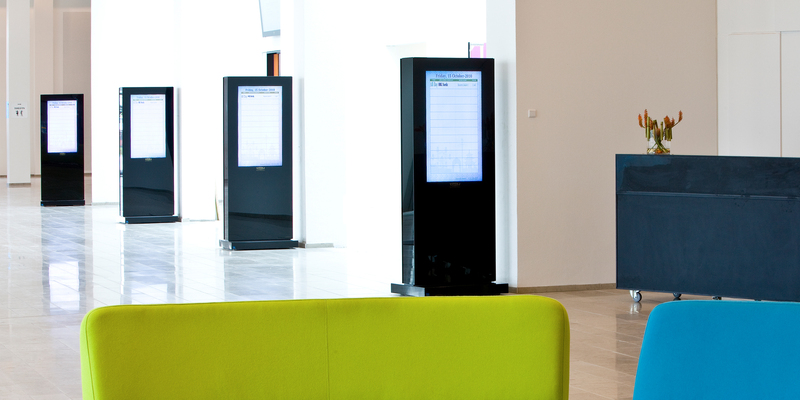 Infrequently used meeting rooms and ‘dead’ areas can be transformed into welcoming spaces where even a small amount of integrated technology can be used to impress prospective clients and visitors to your business. Each meeting room will come with its own unique specifications and therefore, we tailor every aspect of the project to the site after making a preliminary site visit to fully understand the requirements and existing facilities. “Digital signs use technologies such as LCD, LED and Projection to display content such as digital images, video, streaming media, and information. 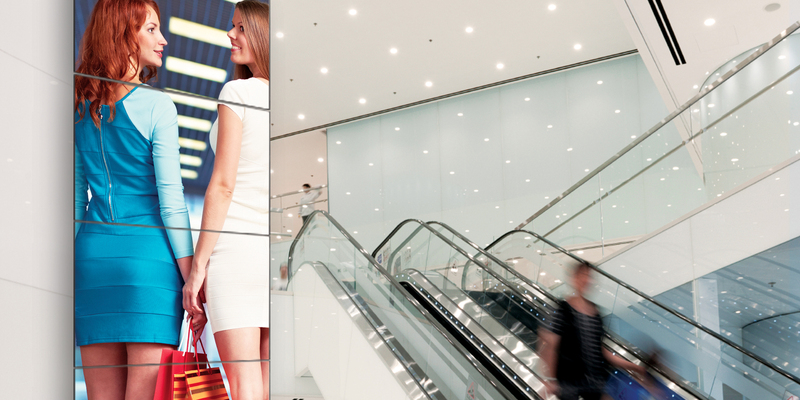 They can be found in public spaces, transportation systems, museums, stadiums, retail stores, hotels, restaurants, and corporate buildings etc, to provide wayfinding, exhibitions, marketing and outdoor advertising”.